As I have mentioned previously various times, Russian tourists were all over the place. My third day would highlight that statement. Sabrina, Lena – sister an niece of Natalia (guesthouse owner) – and I would take off for Ritsa Lake…. with a tour bus. I thought it might get terrible. And it did. But I also thought it would be a good way to to get a better impression of what Russian tourists were doing in Abkhazia. And I did that, too. So I decided to join the two. It felt just like I imagined any touristic bus tour anywhere in the world. The guide sitting in the front babbling all the time too fast about buildings and sights we were passing, most of the passengers losing attention after a while, either non-stop filming the entire trip, or starring out of the window, except the middle elderly teacher type of person in the back making half funny comments and jokes whenever he gets the chance. We got a 30-minutes ”break” in a half-heartedly arranged wine cellar next to the road. Since I hadn’t had breakfast, the wine tasting I was using to drink away my annoyance from the people had quite a strong physical effect on me. Noticing that, I hoped for a water and bread tasting right after, but got disappointed, although the following cheese tasting was kind of a relief for me. We made a lot of stops. 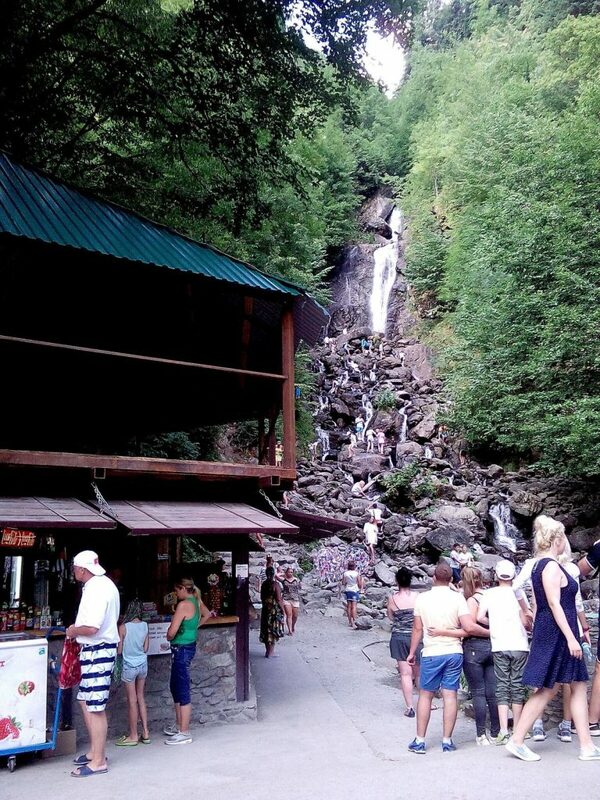 We stopped at a beekeeping, one waterfall, two waterfalls, three… I stopped counting. We stopped for some lakes, canyons, rivers and stone walls to see. From stop to stop with the guide explaining things in the front, the teacher commenting things in the back, and Lena asking funny questions, like if I prefer swimming with yellow or blue shorts, from the left. When we made a stop, we would walk out, have a second of a ‘wow moment’ and then stand in line to take ‘portraits’ or selfies in front of the scenery that we stopped for. Since I am still not used to that kind of picture taking, I sticked to my random photo takin of things I saw. Often many busses stopped at the same spot the same time. At one point I almost felt weird not taking a selfie since people were asking me, why I wouldn’t take a photo of me and kindly offered that they could take this photo instead. 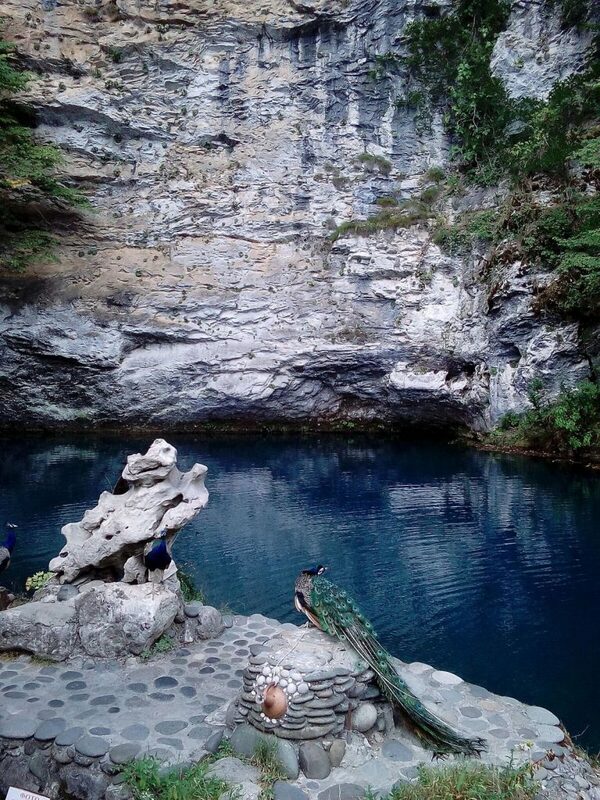 Apart from that I was fascinated by some sights like the Lover’s Waterfall, that could be climbed, the Ritsa Canyon with its massive rocky walls, and the Ritsa Lake itself. 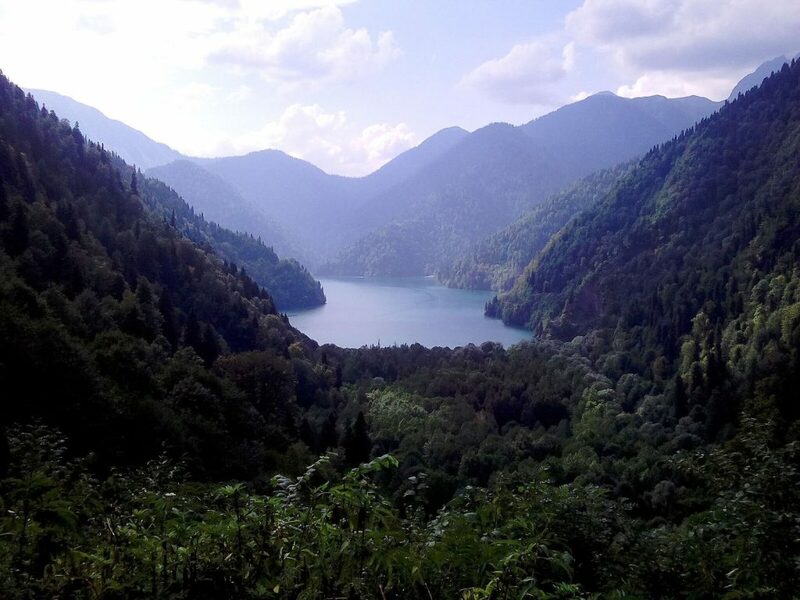 Deep blue between foresty mountains, you could feel how the trees and the lake cleansed and refreshed the air – truely a phenomenon. My favorite part was the 30 minutes break to enjoy the lake’s shore. Since I forgot to bring swimming shorts and towel I couldn’t really go swimming but instead I went as far into the water as I could. I probably looked strange putting my arms and forehead also under the water, so that all but my torso and neck was covered by it. At some point the entire bus figured, I wasn’t Russian and necessarily I again was congratulated for ‘our’ good cars and ‘our’ low unemployment. When the conversations turned to the subject of why chose Abkhazia as a place to spend your holidays in, it was almost unisono something like: ”Because Abkhazia is cheap and the landscape beautiful. You have everything here. Mountains, the sea, mountains at the sea”. Apart from that I heard different stories of couples coming here every year all the way from Moscow because they would discover something new every time – although they also did the Ritsa bus tour for the second time already or from a family that wanted to show their children the Black Sea but the hotels in Sochi were just too expensive. One couple was a bit different, though. They actually visited an Abkhazian friend the wife had made back in university. Being in their late 60s Dimitry and Natalia (no the guesthouse owner) hadn’t met for decades and found each other after all that time through social media. Dimitry from Sukhumi already had visited her and her husband Peter in Moscow last year and now they met here. Anyways, all the answers from this buses’ passengers were rather unpolitcal. The topic of Abkhazia being a break-away state in a tense situation didn’t come up until the point when the coversation would turn on me. They all expressed their concerns about me traveling alone and that apparently some parts Abkhazia weren’t save. It is understandable. But after all sightseeing in Abkhazia didn’t feel different from any other place at all. Only wandering through abandoned streets or quarters the presence of many destructed objects everywhere made a difference so far. Back in the bus one of our last stops was the restaurant where we would have our dinner. It was below average ”shashlik, pizza, khachapuri”-cuisine but good enough to fill up my empty stomach. I took the chance to talk to the guide. She was an actual Abkhazian speaking Abkhazian and eager to teach me some phonetics. Undoable. After I had almost swallowed my tongue to make the special Abkhazian ‘l-sound’, I asked her about her point of view on Abkhazia. What is it she would like? ”To be left to be on our own”, she replied,”I don’t trust politics, nor politicians. They all failed us”. She elaborated that all that politics in Abkhazia led to despair. Russian, Georgian and now Abkhazian politics. She said, she didn’t want Abkazia to be a playball between Russia and Georgia. And ”I don’t hate them”, was her reply when I asked her about her opinion on Georgians. After we were all fed and everyone had their visit to the toilet, we started our way home. 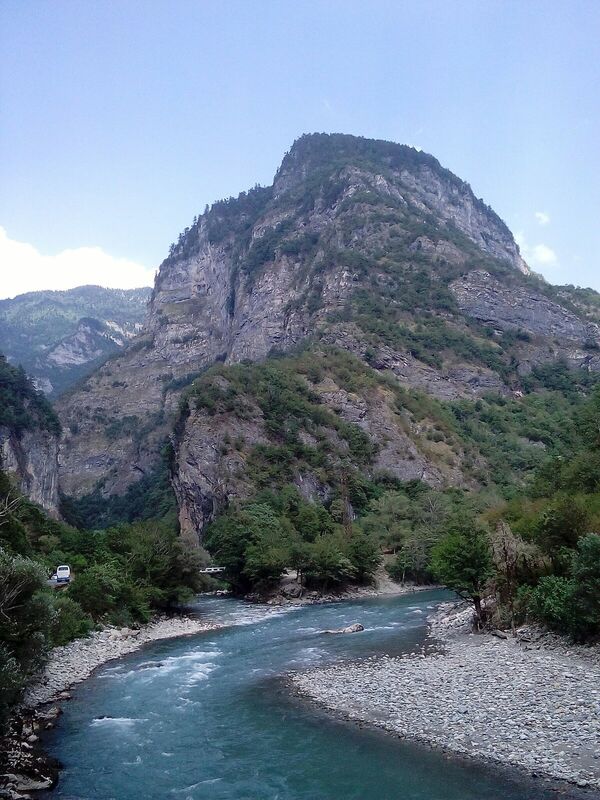 Back through the canyon, passing Gagra, then alongside the coast until Sukhumi where we came from. Generously every person/ familiy/ group was brought to their doorsteps including the guide. Every participant was said goodbye to by the remaining passengers. When sun was already gone down, we eventually reached our house and were quite tired from all the impressions and information we got and the long sitting in the bus. We said good night with an exhausted ”’that was beautiful”. 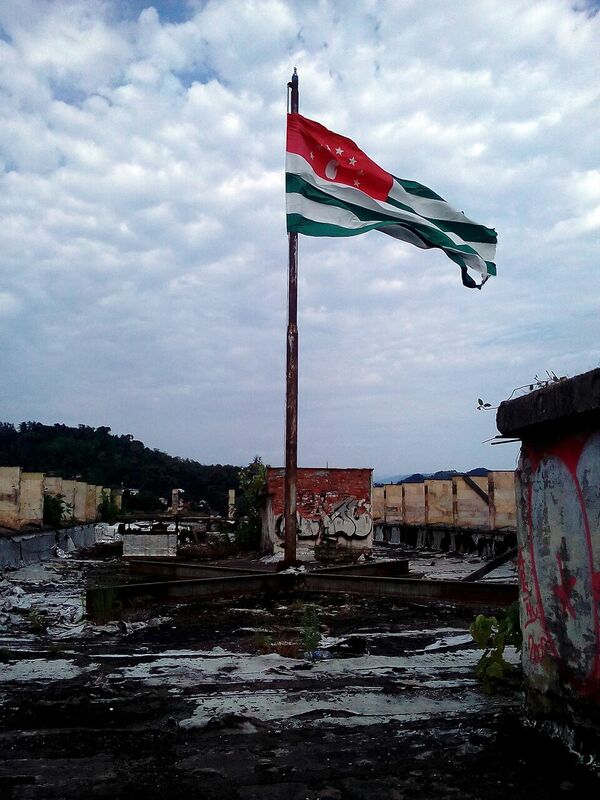 Next chapter of the “Abkhazian Diary” will be published on 22 of September. Title: Day #4 – My Day Off.